It’s been a while since my last newsletter but I have been sitting on a few up-and-coming projects, as we head in to the last few months of the year, and making samples, has taken a while. We get asked frequently if we do classes, so I hope that some of the workshops listed below might motivate you to come in and sign up for a class or two. The aim of our workshops is for you to make something for yourself, but hopefully, you enjoy it so much that you want to make a couple more as gifts for your friends and family as the end of the year looms. Our Tuesday and Wednesday morning classes are usually full and I’m super proud of the Tuesday night class girls who have all recently completed their first strip quilt. Every single quilt looks fantastic! Even though the girls all used the same pattern, their choice of fabrics has made each quilt so different and I know they are all quite pleased with themselves on their first completed project! It is so satisfying to see new passion and creativity being released in these classes. Sometimes there will be an opportunity to squeeze another person in to a class, so if you are really keen to commit to weekly classes, please ask when you come in to the shop. Alternatively, we have lots of one off workshops on offer between now and mid December, so please book your spot early if a class is calling your name! This has already been a popular class and so we are repeating it. Zippy Bags make great presents and are ideal to use as makeup bags, sewing storage bags or a bag to store all sorts of bits and bobs in. Classes will be held on Saturday 13th October 10am-2pm and Friday 19th October 10am-2pm. This class will be an adaption of the ‘Love from Beth’ Bubble Pods. Again, a great storage idea for the bedroom, craft room or bathroom. 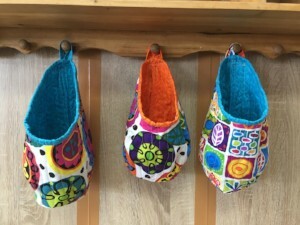 We have some really funky fabrics that look great in these pods. We have hung a set of 3 on some hooks that David has made and they look great! 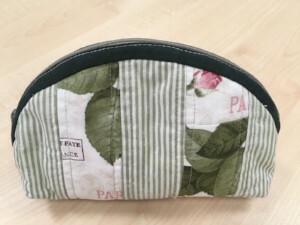 You will need 2 Fat Quarters to make one pod and some batting along with your normal sewing notions and your sewing machine. Classes will be held on Saturday 27th October 10am-2pm, Thursday 1st November 10am-2pm and Saturday 17th November 10am-2pm. After a hugely successful bag workshop run over 2 days, we have enough interest to do this class again, so Jenny will repeat this workshop on Saturday 10th November and Saturday 24th November from 9:30-4:30. 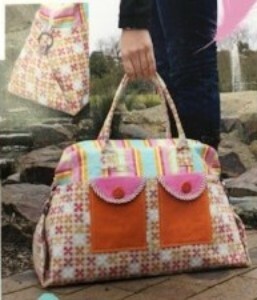 You will make a totally unique Overnight bag that will be much admired by everybody! 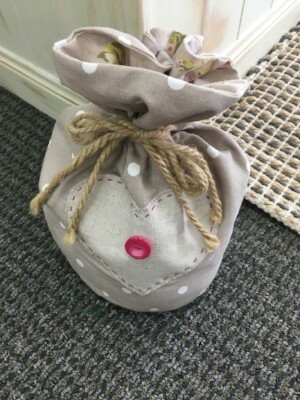 Jenny has made these bags for all her grandchildren and is now on her second round as the grandchildren move into their teenage years. We have a list of requirements for this class in store. Class fees are $100 for the 2-day workshop. 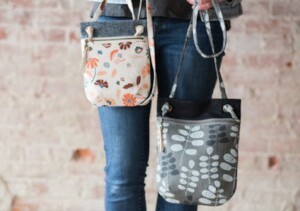 Use some of our gorgeous linens to make a simple cross body bag. The zippered front opening is perfect for easy and secure access to your most important items and elegant darts help bring shaping to the bag as well as adding sophisticated detail. An interior pocket is perfect for your pen and phone. You will have to trust me on this one! All you will need for this class is 2 of your favourite fat quarters and a fat quarter of batting. You will make a very practical gift either for yourself or to giveaway. We will provide the extra bits you need to complete your project. If you manage to finish this little mystery project in class you may want to make more as simple Christmas gifts. We are always being asked if we do alterations, and I am delighted to now say YES, WE DO! Lynn has recently moved to Taupo and has been doing alterations and dressmaking for years in the Manawatu area, so we feel very privileged to be able to use her talents in our store. Our prices are very much in line with other alterations services in Taupo. If you drop off your garments there will be a week turn around as Lynn will collect and return items on a Thursday or Friday weekly. Lynn is also great at dressmaking, and I have already booked her in to whip up a couple of Summer skirts for me using our lovely new range of linen fabrics. We have been away several times over the past few weeks attending the NZ Gift Fair and some other Trade shows, and we have ordered lots of products which will be arriving over the next few weeks. Some are sewing related, others are more along the giftware and homewares line. We are always looking at new ideas and how we can improve the range we have. You may have noticed that some of our linen duvets and sheets have been massively reduced to make way for new stock coming through. We have some lovely new jute and cotton rugs arriving soon and some cool new recyclable bags on their way in the next month. Another exciting announcement is that we have added a new service to The Eye Of A Needle. As well as servicing sewing machines, my husband David has branched out with TEOAN Services. He loves doing garden maintenance, cleaning up sections, mowing lawns and doing odd jobs around the place, as well as sharpening scissors and tools. If you need any kind of home maintenance done, please consider him for the job. I can highly recommend him! Last but not least – many of you local ladies will be aware that the Taupo Quiltmakers have their annual exhibition at Taupo-Nui-A-Tia College from Friday 5th- Sunday 7th October. There will be lots of lovely quilts and projects to admire over the three days, and if you attend this exhibition you will be able to pick up a discount voucher that you can use in our store over that weekend.